After undergoing a tooth extraction, it is important to follow the proper aftercare procedures for at least 24 hours after having your tooth pulled. If your tooth extraction won’t stop bleeding, contact us immediately so we can determine the best action to take to alleviate the issue. While this page contains helpful and common aftercare guidelines to follow after having a tooth extraction, your situation could be a special circumstance. This is why it is crucial to discuss your aftercare plan with Stonebridge Dental so we can provide you with personalized care. Control the Bleeding with a gauze. Place a piece of clean damp gauze on top of the tooth socket. Roll it up or fold it into a square. This will be the part that rests on top of your wound so this is important. Bite firmly on the gauze for 45 – 60 minutes. Ensure the gauze is always positioned well and large enough that it applies pressure directly onto the site of the tooth extraction. One of the main components of tea is tannic acid which aids in the forming of blood clots, thus making tea bags an effective technique to stop bleeding. Follow the same instructions as you would with the gauze noted above. Blood clots that form within the empty socket are an important factor within the healing process. You should be careful not to do anything to disrupt its formation. 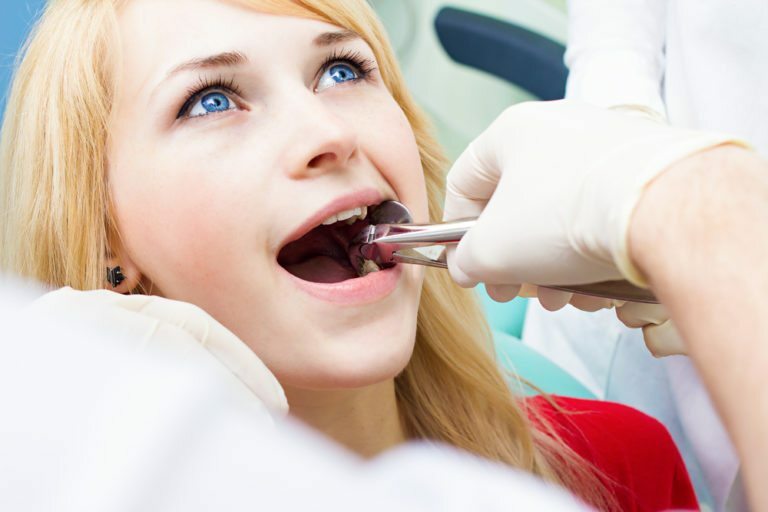 There are many steps to take to protect the developing blood clot within the first 24 hours after a tooth extraction. Minimize the air pressure differences. Avoid creating pressure within your mouth or sinuses as these may dislodge the actual blood clot from the socket. This means you should avoid smoking or using a straw as these cause suction. Avoid blowing your nose and sneeze with your mouth open. Avoid playing wind instruments for a few days to ease up on the sensitivity. Avoid difficult work or strenuous exercise. You should avoid bending or lifting heavy objects altogether. You should try taking it easy for at least 1-2 days after the tooth extraction. When you are resting or sleeping, try to lie down so that your head is above your heart. This will lower your blood pressure and help control bleeding. When your tooth is extracted, your tissues undergo some trauma and will swell and cause sensitivity. The amount of swelling that occurs could be slight or very large. Smokers will experience more complications with a tooth extraction including increased bleeding. Avoid smoking for at least 48 hours after having the tooth pulled out. After a tooth extraction, eat only soft or liquid form foods for at least the first 24 hours following the surgery. Do not vigorously chew anything. Avoid hard or crunchy foods that can further traumatize the extraction site and cause further bleeding. Do not consume hot liquids as they will dissolve the blood clot. If you are experiencing high levels of pain, contact us immediately so we can prescribe you some medications for your tooth extraction.